Sauteing with garlic and olive oil brings the taste of spinach up to a whole new level. It's so easy to make and really delicious. Sauteing with garlic and olive oil brings the taste of spinach up to a whole new level. It's so easy to make and really delicious. Each serving has just 41 calories, 3 grams of fat and only 1 Weight Watchers SmartPoints. There are two main varieties of spinach: flat-leaf and curly (baby spinach). The flat-leaf kind can be round or pointed while young baby spinach is tender and delicate. Fresh spinach cooks down to nothing. 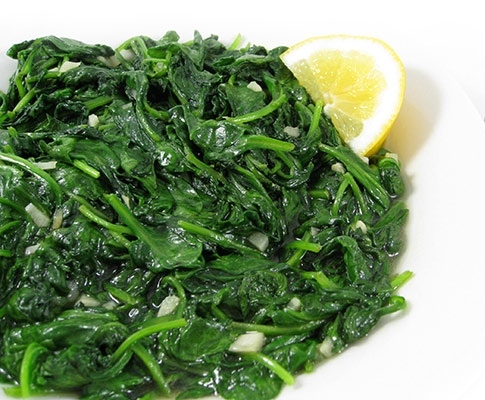 About 1 pound of raw spinach will yield 1 cup cooked. 1. The nutrition facts were calculated on Spark People.com. 2. The Weight Watchers SmartPoints and Points Plus were calculated on CalculatorCat.com.